Information about the opera Salome by Richard Strauss, and the best recordings available on CD or DVD, or for download. A powerful study in obsession and infatuation, with a passionate orchestral score, and a libretto that keeps almost faithfully to Oscar Wilde's play. The opera takes place on the terrace of Herod's palace, outside the banqueting hall. The young Syrian captain Narraboth declares his love for Salome, daughter of Herodias. The ominous voice of Jokanaan (John the Baptist) is heard from his dungeon below, urging repentance. Salome enters the terrace and bribes Narraboth to bring Jokanaan out of the dungeon. She then watches in fascination as Jokanaan condemns the wickedness of her mother, who killed her own husband in order to marry Herod, and of Herod himself. Salome expresses her desire for him and unsuccessfully tries to tempt him, causing Narraboth to kill himself in despair. Jokanaan is led away, and then Herod and Herodias come onto the terrace. Herod lustfully invites Salome to sit with him. Herod is in awe of Jokanaan, while five Jews dispute about his teaching. Herod promises Salome whatever she wants if she will dance for him. After dancing the provocative "Dance of the Seven Veils" she demands the head of Jokanaan in payment. After protests Herod submits and Jokanaan is executed. His head is brought in, and Salome passionately kisses the severed head while Herod watches appalled. Finally he commands her death. This recording, remastered from the original tapes, is the last of Clemens Krauss's recordings of the Strauss operas and provides a classic interpretation of Salome. Vienna Philharmonic Orchestra, conducted by Clemens Krauss, 1954. Cast: Christel Goltz (Salome), Hans Braun (Jokanaan), Julius Patzak (Herod), Margherita Kenney (Herodias), Anton Dermota (Narraboth). Originally released on LP by Decca and available on Salome (c. Krauss), this is a classic interpretation of Salome. Superb sound, despite its age, and Birgit Nilsson is outstanding in the title role. Vienna Philharmonic Orchestra, conducted by Sir Georg Solti, 1961. Cast: Birgit Nilsson (Salome), Eberhard Wächter (Jokanaan), Gerhard Stolze (Herod), Grace Hoffman (Herodias), Waldemar Kmentt (Narraboth). Sinopoli takes a more restrained approach than other famous recordings, which with its superb studio sound makes this one of the most accessible versions. Berlin Deutsche Oper Orchestra, conducted by Giuseppe Sinopoli, 12/90. Cast: Cheryl Studer (Salome), Bryn Terfel (Jokanaan), Horst Hiestermann (Herod), Leonie Rysanek (Herodias), Clemens Bieber (Narraboth). 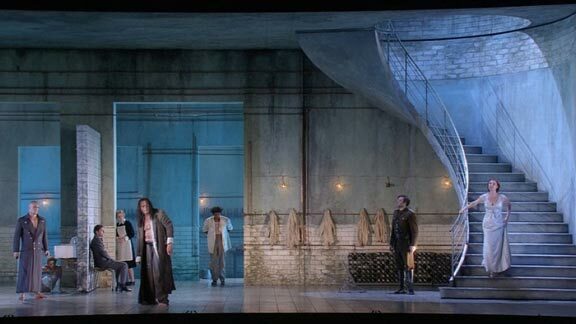 Salome has commanded Narraboth to release Jokanann (John the Baptist) from his cell, in Richard Strauss's opera Salome. David McVicar's production, which sets the opera in a debauched palace in Nazi Germany, doesn't succeed in creating the oppressive atmosphere that the unfolding drama needs, and Nadja Michael's Salome is too restrained. Royal Opera House Covent Garden Orchestra, conducted by Philippe Jordan, 2008. Cast: Nadja Michael (Salome), Michael Volle (Jokanaan), Thomas Moser (Herod), Michaela Schuster (Herodias), Joseph Kaiser (Narraboth). A superb 1992 production from Covent Garden, with Maria Ewing convincing as the obsessed teenager Salome; both Herod and Herodias are also excellent. Royal Opera House Covent Garden Orchestra, conducted by Sir Edward Downes, 1992. Cast: Maria Ewing (Salome), Michael Devlin (Jokanaan), Kenneth Riegel (Herod), Gillian Knight (Herodias). A welcome reissue of this superb Peter Hall production at Covent Garden, featuring Maria Ewing giving a totally convincing performance the title role.